USDA replacing junk food in schools with "smart snacks"
Students, say goodbye to junk food temptations during school hours. The U.S. Department of Agriculture is replacing potato chips and candy bars with baked chips and granola bars as part of new standards for the nation's schools. "Nothing is more important than the health and well-being of our children," Agriculture Secretary Tom Vilsack said in a press release. "Parents and schools work hard to give our youngsters the opportunity to grow up healthy and strong, and providing healthy options throughout school cafeterias, vending machines, and snack bars will support their great efforts." The new initiative is part of the Healthy, Hunger-Free Kids Act of 2010, which required the USDA to place nutrition standards on all food sold in schools. USDA school lunch changes: What's on the menu? Smart Snacks uses science-based nutrition guidelines and practical expectations to try and get kids to choose healthier items. More whole grains, low fat dairy, fruits and vegetables and leaner protein are promoted. Foods high in fat, sugar and sodium are made less available. The plan only affects foods sold during the day, and items sold at after school sporting events or other activities are not included. Before the new standards, chocolate sandwich cookies (286 calories; 182 empty calories), fruit flavored candies (249 calories; 177 empty calories), donuts (242 calories; 147 empty calories), chocolate bars (235 calories; 112 empty calories) and regular soda (136 calories; 126 empty calories) would have been allowed. Now, students can try peanuts (170 calories; 0 empty calories), light popcorn (161 calories; 17 empty calories), low-fat tortilla chips (118 calories; 0 empty calories), granola bars (95 calories; 32 empty calories), fruit cups (68 calories; 0 empty calories) and no-calorie flavored water (0 calories; 0 empty calories). "It's important to teach children healthy eating habits that will affect their health throughout their lives," Margo Wootan, the nutrition policy director at the Center for Science in the Public Interest, told Bloomberg Businessweek. 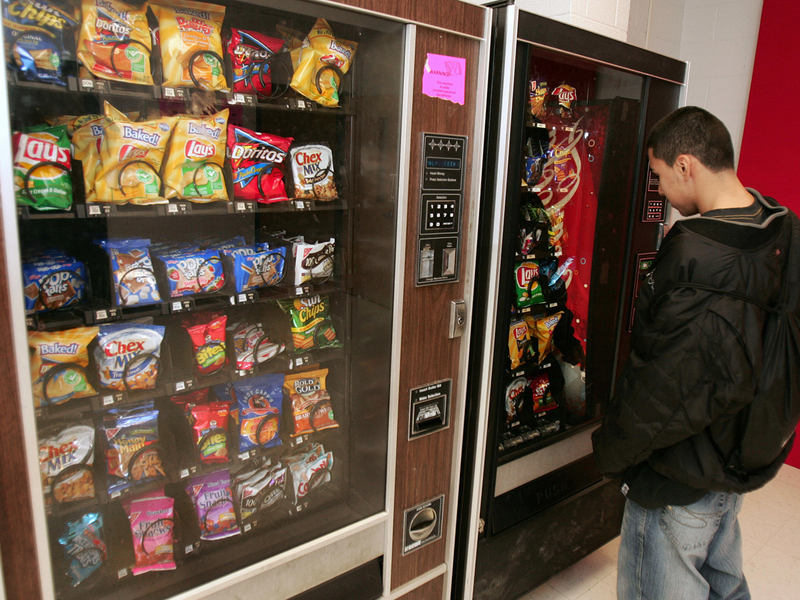 "It doesn't make sense for schools to teach nutrition in the classroom, then counter it by selling sugary drinks and candy bars in vending machines in the hallway." The standards depend on the various age groups, and are a basic minimum so schools can adjust the plan according to their needs. Parents will still be allowed to send their kids to school with homemade lunches and treats, and fundraisers and bake sales will still be allowed. "Altogether, the policy and the set of standards that USDA announced is stronger than what exists in any states and most school districts I can think of," Wootan said. The final plan was based on nearly 250,000 comments on the proposal. The schools have a year to make their changes. Sandra Ford, president of the School Nutrition Association, a non-profit group representing school food-service professionals, told USA Today that school cafeterias are on their way to compliance, with breakfast standards and lower sodium limits changing as soon as fall. "We need time to evaluate the impact of these changes on school meal programs and to encourage students to accept these healthier choices," she said.